Under the programme, around 80 per cent of phones passed on for recycling are refurbished and resold elsewhere in the world. The other 20 per cent are deconstructed, commoditised and their component material is recovered with a better than 95 per cent recycling rate. The accreditation has been granted under the Product Stewardship Scheme, where parties take responsibilty for the environmental effects of products from the tiem they are product until they are disposed of. TCF outgoing Chief Executive David Stone says the programme is the first e-waste recycling programme in the country to achieve Government accreditation. “This Government seal of approval of our programme is proof that it has met its environmental requirements for accreditation. Now anyone who wants to recycle their phone knows that they are using an approved scheme,” he says. To gain accreditation, the TCF has agreed to key targets to reduce the number of phones going to landfill and to further encourage consumers to drop their old phones into their nearest store to ensure they get recycled. Under the programme, around 80 per cent of phones passed on for recycling are refurbished and resold elsewhere in the world, reducing the demand for new handsets and associated environmental impacts of their manufacture. The other 20 per cent are deconstructed, commoditised and their component material is recovered with a better than 95 per cent recycling rate. Scheme recycling agent Swapkit New Zealand collects and sorts the phones into those which can be used and those which are end of life. Reusable phones are sold by tender overseas, and end-of-life phones are sent to Sims Recycling Solutions and Zero Waste NZ for breakdown and recovery of component materials. The accreditation is an extension of the work that TCF has been doing since 2010, when it brought together Vodafone, Telecom and 2Degrees in a collaborative partnership to establish the recycling programme. 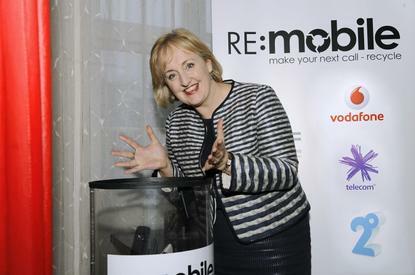 All three mobile companies offer recycling drop-in bins and recycling envelopes at their stores. According to NZTCF, one in four Kiwis still do not know where to take unwanted phones or even know that they could be recycled. “We hope that people will be encouraged to bring in their unwanted phones to Vodafone, Telecom and 2degrees stores around the country following the Government endorsement of this programme. Over 70 per cent of Kiwis have at least one unconnected mobile in their house, this tells us that there are many phones still lying around in people’s homes,” he says. RE:MOBILE accepts mobile phones, mobile data devices and accessories. “We are looking to extend the capability of the programme, so watch this space,” says Stone. Since January 2014, over 45,000 mobile phones have been recycled. TCF aims to increase volumes collected by 24 per cent each year so we exceed over 292,000 phones a year by 2020. A percentage of the profits from the programme go to the Starship Foundation to support Starship National Children’s Hospital and the Starship National Air Ambulance Service.